Twelve years ago, the workforce at Pulverman Precision Metal Components numbered eight and generated annual revenues of roughly $500,000. Today the company employs 190 people, with annual revenues approaching $30 million. To say the company has grown quickly is perhaps an understatement. 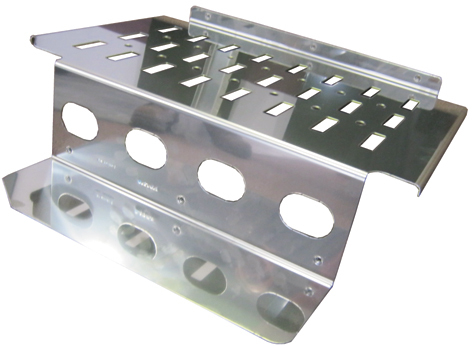 This truck heat shield, the first part Pulverman produced using its new turret-press tooling, is manufactured entirely on a turret punch press from 14-gauge Type 304 bright annealed stainless steel. The material tends to wear tooling quickly, but that’s not been an issue since switching to Wilson Tool’s EXP tooling. Founded in the early 1940s in Wilkes-Barre, PA, Pulverman now operates out of an 80,000-sq.-ft. plant in Dallas, PA, supplying custom-fabricated metal products. The firm performs laser cutting, stamping, precision forming, welding, powder coating and assembly for customers working in the transportation, construction, HVAC, electronics, computers and appliance industries. Its rapid expansion can be credited in part to a boom in the heavy-trucking industry, as its fortunes grew along with a major customer in that industry. During the recent economic downturn, the company chose not to rely so heavily on its one major trucking-industry customer, so management made a serious effort to diversify its product line and acquire new customers in new industries. The strategy has worked remarkably well. Not only has Pulverman gained customers across a wide range of industries, but it has experienced double-digit growth during all but one of the past 12 years. Its equipment list includes three CNC laser-cutting machines, rated to 4000 W; 15 stamping presses, from 60 to 300 tons; several arc- and resistance-welding machines; 12 CNC press brakes, the largest a 10-ft. by 140-ton model; and seven CNC turret-punch presses. Pulverman punches the bolt holes and perforations on this muffler heat shield on its turret presses. The part is of 16-gauge Type 304 bright annealed stainless steel. To equip its hard-working turret presses, over the years Pulverman has accumulated a varied tooling inventory from several tooling suppliers. Its variety of machine and tooling suppliers tended to cause confusion. Enter Wilson Tool, White Bear Lake, MN, which introduced its EXP punch technology to Pulverman to help ease the confusion. And when the Pulverman management team learned that EXP tooling utilizes standard punch holders with universal punches, it leapt at the opportunity to standardize and simplify its tooling inventory. Rather than use multiple types of thick turret tooling, it now sources with one tooling manufacturer—Wilson—and stocks a single punch inventory that can be used throughout the shop. EXP punch technology is available for all major brands of thick turret tooling and is fully compatible with all current guide assemblies. Pulverman is systematically replacing its old tooling, as the old punches wear out, with EXP punch technology. “Often, when our old punches wear out, we just replace them because the spring packs and the punch guides are still good. It doesn’t make sense to throw them out,” adds Yermal. 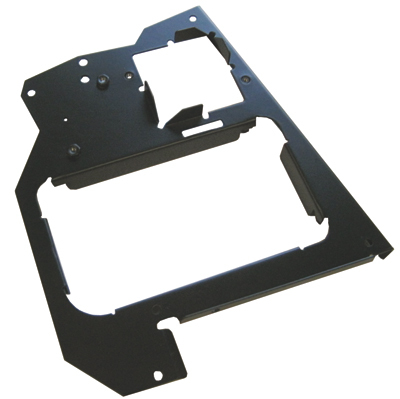 Turret punching manufactures this truck dash structure, of 16-gauge cold-rolled steel. Pulverman has enjoyed significant cost savings since standardizing its punch inventory. While upfront costs may be higher to purchase the holder and the punch when compared to buying just a regular punch, moving forward the firm only needs to replace the punch insert. This has proven to be much less expensive than buying a full replacement punch. Pulverman fabricates a variety of materials, including mild steel, stainless steel and aluminum. In particular, stainless-steel and aluminum work tends to be very finish-sensitive, requiring polished finishes without scratches. Not only does EXP punch tooling handle this variety well, it’s also showing little signs of wear. Yermal also appreciates the quicker changeover times realized with the new tooling. Once an operator removes the guide assembly, there’s no need to twist out the punch holder. Changing punches is a simple matter of switching punch inserts. For Pulverman, upgrading its punch technology represents the firm’s “constant effort to expand our business, attract new customers and make sure we stay on top of quality and delivery, to keep our customers happy,” says Yermal. Article provided by Wilson Tool International, White Bear Lake, MN: 800/328-9646; www.wilsontool.com.